Pioneer Bank is a COMMUNITY BANK which provides products and services that foster community well-being. Their investments in real estate development and local business growth translate into job creation, affordable housing, and increased public revenue. Pioneer Bank began its volunteer program, Team Pioneer, in 2017. Through the volunteer program, the Bank has donated resources to hundreds of community nonprofits, with its employees volunteering more than 2,600 hours of their own time in 2018 in support of the community’s endeavors. Non-profit organizations now have the opportunity to contact the Bank to contribute financially or request volunteers. Many of the Team Pioneer team members are involved in a variety of community organizations. As a community bank, Pioneer is committed to making a positive difference by engaging in meaningful and effective programs that work to improve the quality of life in our own communities and neighborhoods. Hours are measured over a 12-month period and awards are designated based on cumulative hours. 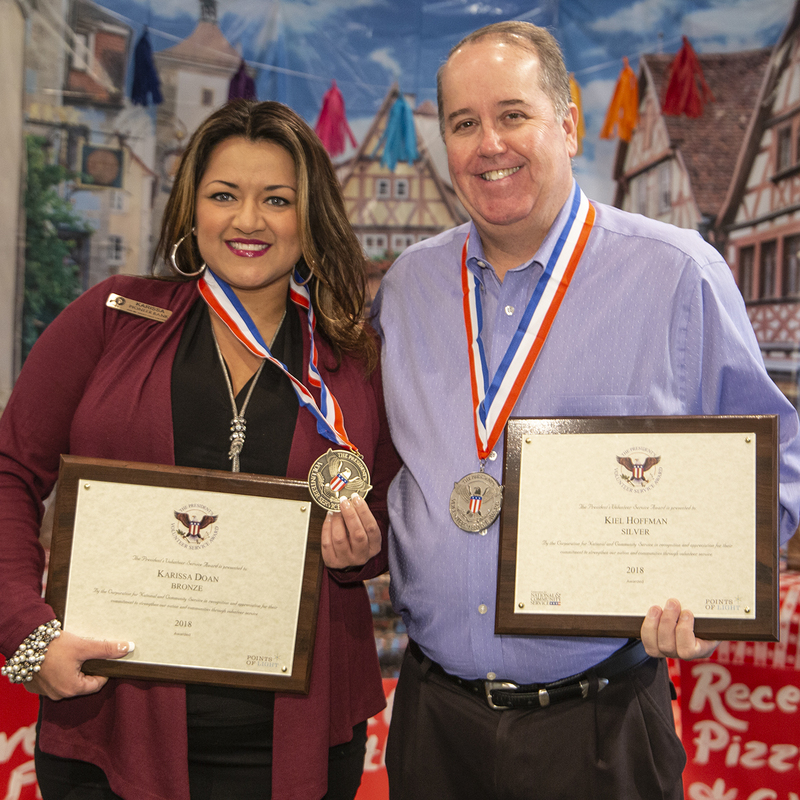 The President’s Volunteer Service Award (PVSA) recognizes, celebrates and inspires our volunteers to lead the charge. The awards are offered in multiple levels and are designed to recognize each milestone of a volunteer’s service achievement. Levels include bronze, silver, gold and the highest honor, the President’s Lifetime Achievement Award for those who contribute more than 4,000 hours of service in their lifetime. Pioneer Bank is proud to announce that five employees have gone above and beyond in volunteering for their communities and have each earned a 2018 Presidential Volunteer Service Award at various levels. 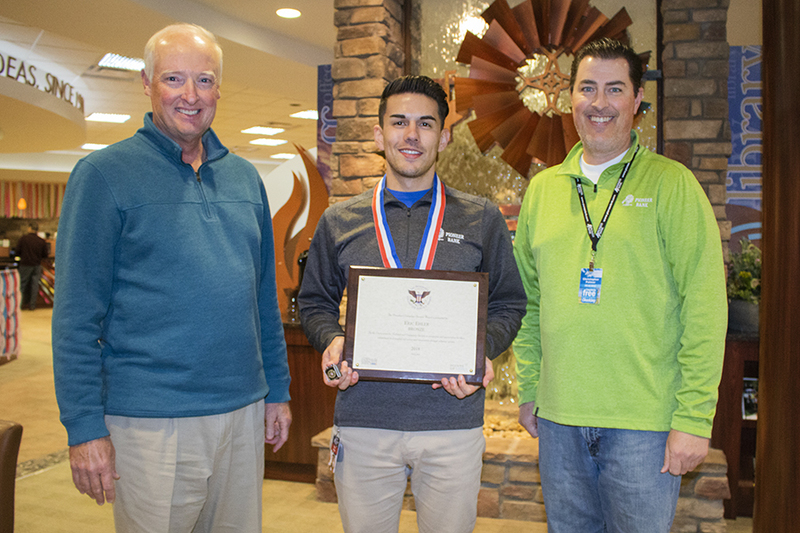 Las Cruces Team Member, Kiel Hoffman, Market President, volunteered over 400 hours throughout the region at various organizations, and has earned the Silver Award. Kiel is involved with many organizations, including the March of Dimes Southern New Mexico, Treasurer; Las Cruces Economic Forum, Past Chair; New Mexico Military Base Commission, Commissioner; The Bridge of Southern NM, Board Member; Mesilla Valley Economic Development Alliance, Board Member; Junior Leadership-Greater Las Cruces Chamber of Commerce, Chair; Las Cruces Days in Santa Fe – Greater Las Cruces Chamber of Commerce; Thanks Team WSMR – Greater Las Cruces Chamber of Commerce; Government Affairs Committee – Greater Las Cruces Chamber of Commerce; Military Affairs Committee – Greater Las Cruces Chamber of Commerce; Conquistadores – Greater Las Cruces Chamber of Commerce; Las Cruces Public Schools Business Advisory Council; and Revolution 120 Treasurer. Karissa Doan, Retail Banking Supervisor in Las Cruces has volunteered over 150 hours helping the Las Cruces business community grow through the Greater Las Cruces Chamber of Commerce Board, Chair of the Conquistadores; Leadership Las Cruces Board, Chair; March for Babies Executive Leadership Team, Executive Council Member; Conquistadores for the Greater Las Cruces Chamber of Commerce Executive Council, Past Chair; Las Cruces Day in Santa Fe Committee, Coordinator of Governor’s Mansion; AM Las Cruces (Business Networking event held 6 times a year), Chair; Bataan Death March Committee, Member ; Thanks Team White Sands Missile Range, Member; and the Las Cruces Young Professionals, Member. She has earned the Bronze Award. 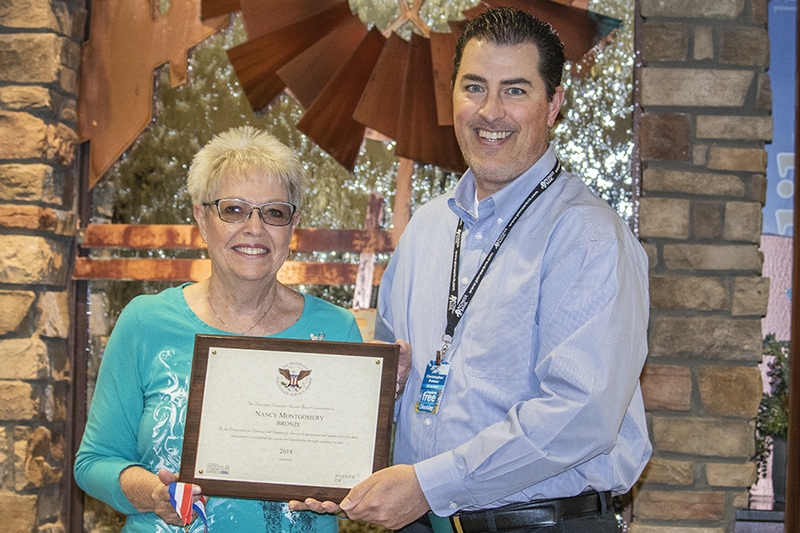 Recently retired Roswell Team Pioneer member, Nancy Montgomery, Retirement Specialist, earned a Bronze Award through her efforts to help retirees with their banking needs. She volunteered over 130 hours at the local retirement homes. Additionally, Team Pioneer member Eric Ehler, Asst. 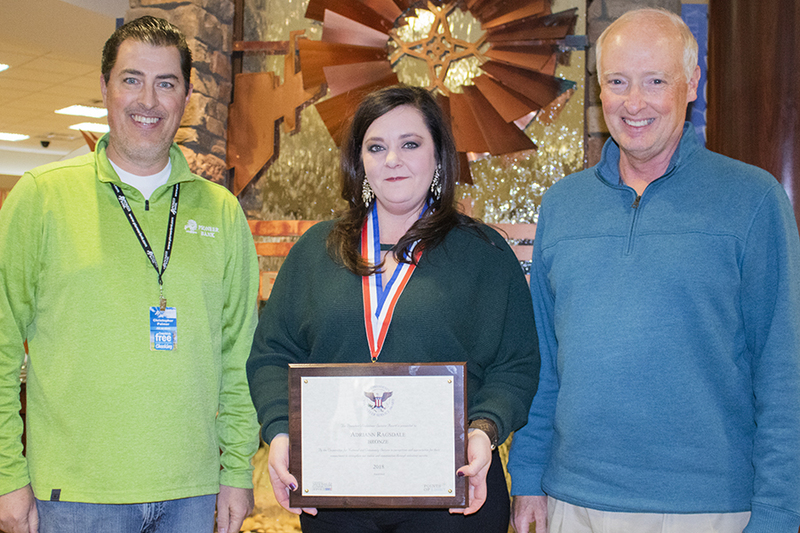 Vice President | Retail Banking Operations/Business Development/Information Security Officer has earned the Bronze Award for volunteering over 110 hours. Adriann Ragsdale, In-House Counsel, volunteered 145 hours in Chaves County. Adriann worked with the Eastern New Mexico State Fair, United Way, Roswell Artist in Residence Foundation, Roswell Library Foundation and Chaves County Bar Association. “I really enjoy giving back to my community and encourage others to volunteer,” stated Adriann. She has earned the Bronze Award. Along with the honor of presidential recognition, recipients received a personalized certificate, an official pin, medallion and a congratulatory letter from the President of the United States. Tags: award, bestbank, foundation, points of light, presidential, service, team. Bookmark the permalink.